Retail Price $145 US dollars. 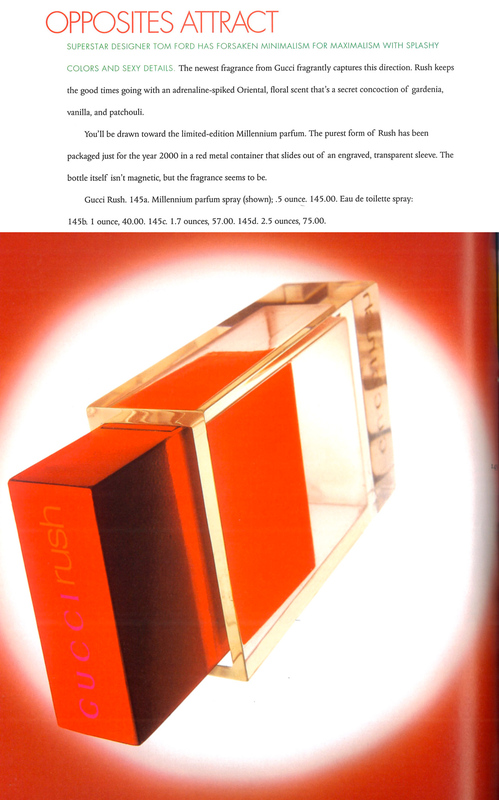 The purest form of Rush was packaged just for the year 2000 in a red metal canister bottle that slides out of a Tom Ford designed Acrylic translucent sleeve engraved with Gucci Rush logo. This is a typical Tom Ford designed that was also used similarly for the Visionaire No. 24 LIGHT, Tom Ford for Gucci Limited Edition Fashion Magazine . That “magazine” was encased in a black acrylic case very similar to this one. Rush is a “magnetic” fragrance with an adrenaline-spiked oriental, floral scent with a gardenia, vanilla, and patchouli touch. This bottle is very nice to the touch, the metallic red surface is always cool to the touch. It’s a spray bottle with 15ml / .5 once of Parfum. I am sure I purchased mine at Neiman Marcus when this ad or page in the catalog came out. I just realized that mine has a red translucent acrylic case and is not clear, but I am 100% this was the millennium edition I was purchasing. The second ad clearly shows the acrylic case in a red tone for the same price of $145.00 . This page I believe from Bloomingdales. 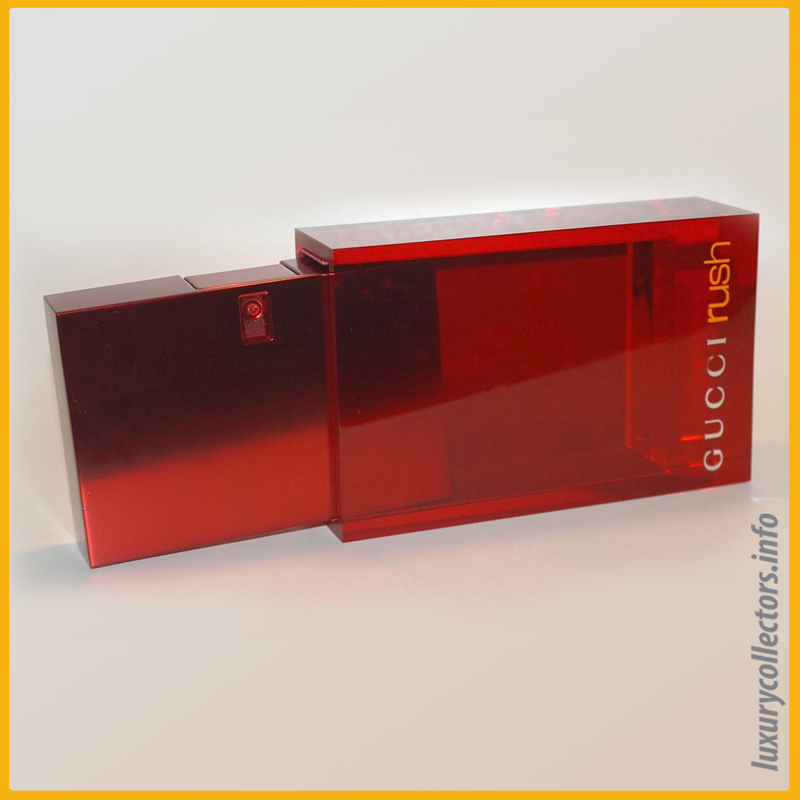 Photographs of Gucci Rush Milennium Limited Edition Bottle of 1999. 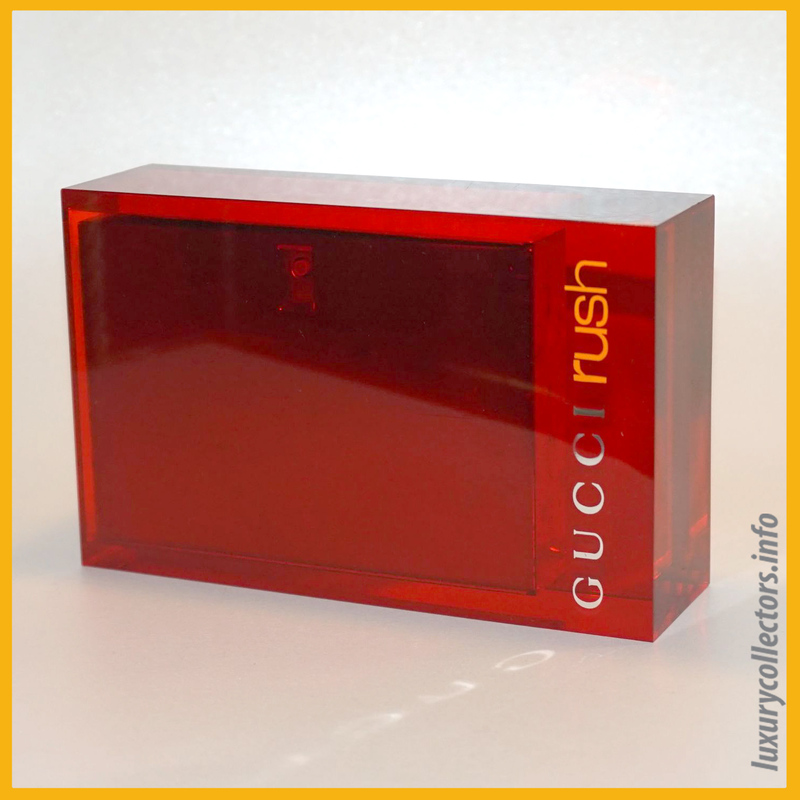 Slide out view of the red metallic Gucci Rush bottle and its acrylic translucent red sleeve. The millennium Gucci Rush spray bottle outside of its sleeve. 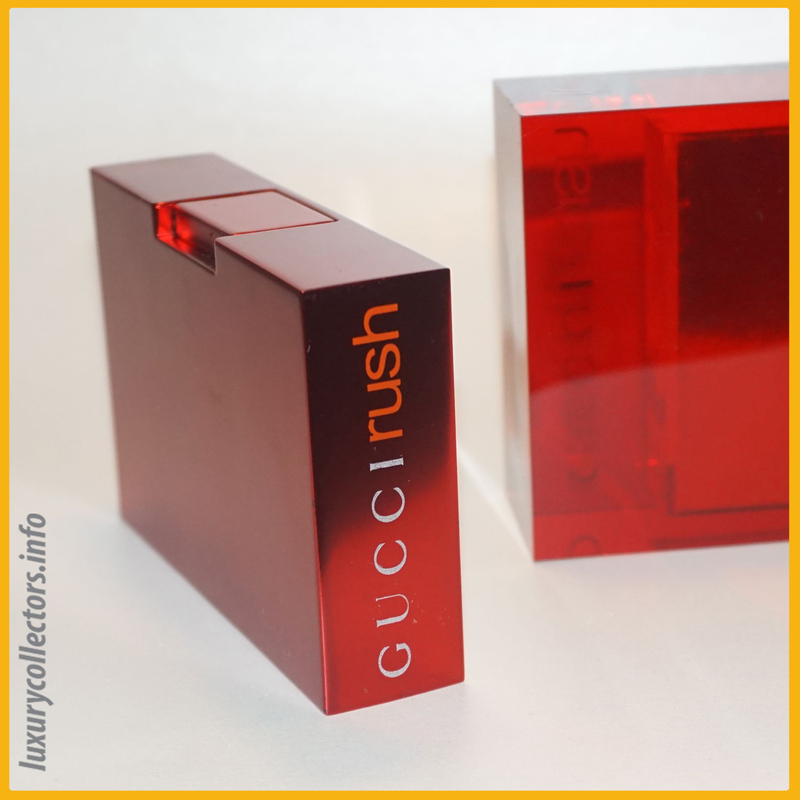 A view of the Gucci Rush acrylic sleeve with the metallic canister bottle inside of the package. 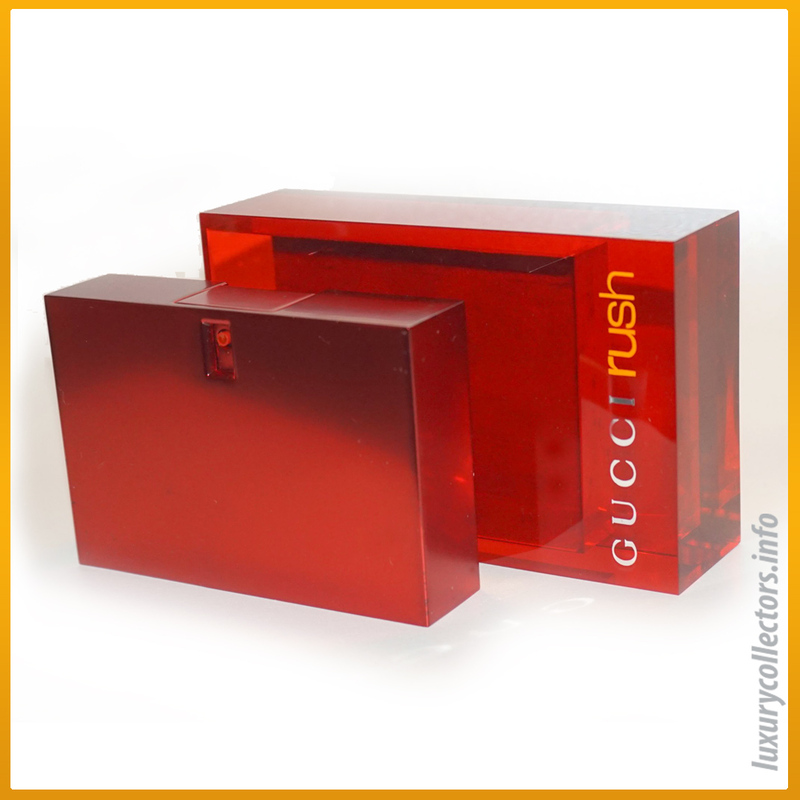 Presentation box for Gucci Rush Milennium Edition. This bottle did not come with any special certificate of authenticity or special markings on the outer box, It came with a transparent wrap but nothing else. The ads from various catalogs is the only reference I have of this special limited edition. Also the inside of the sleeve is lined in a beige velvet material that is glued to the acrylic sleeve, as to help the metalic bottle slip in and out. Unfortunately like all textiles in perfume packaging this material is exposed to moisture and the elements and it can become spotted. It is pretty rare that Gucci has released a limited edition like this. 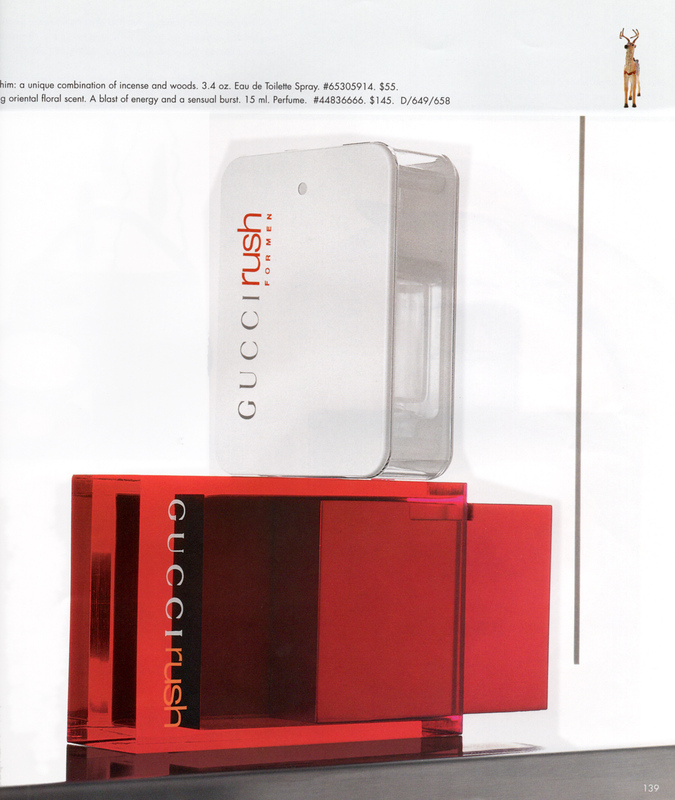 Advertisements of Gucci Rush Milennium Limited Edition Bottle of 1999. Oposites Attract: A page from a 1999 Neiman Marcus Holiday Catalog. A page from a 1999 Bloomingdales Holiday Catalog.